The Palestinian Authority (PA) and Fatah, the faction of PA chairman Mahmoud Abbas, didn't let the peace talks with Israel deter their annual praising of the most lethal terror attack on Israel. Both groups reveled in the March 11 anniversary of arch-terrorist Dalal Mughrabi's horrific massacre. In 1978, Mughrabi led a group of terrorists from Lebanon to Israel, where they hijacked a bus and killed 37 Israeli civilians, among them 12 children. Abbas's advisor on NGOs, Sultan Abu Al-Einen, saw fit to say at an event broadcast on official PA TV this Monday that Mughrabi "would not agree to anything other than to establish her state between Yafo (near Tel Aviv) and Lebanon in her special way." Al-Einen added "they [Israelis] are deluding themselves if they think the negotiations are our only choice. Let the young people hear me: Allah, honor us with Martyrdom. Allah, give us the honor of being part of the procession of Martyrs." Palestinian Media Watch translated the remarks. The remarks bring to mind the statements of a senior PA official and confidante of Abbas last Wednesday on PA TV, who called Israelis "an advanced instrument of evil," claiming "Allah will gather them so that we can kill them." Al-Einen was by no means the only one to get in on the action praising Mughrabi. 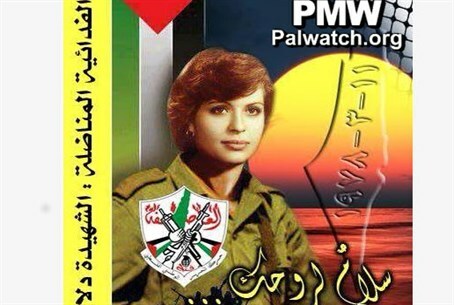 Fatah Spokesman Ahmad Assaf spoke at a separate event, and was quoted last Wednesday in the official PA daily calling Mughrabi "an extraordinary example of struggle, whose headline is bravery, heroism, sacrifice and courage," and who "inspired her generation and the next generations." The PA paper reported on Monday that at the event "Fatah promised to the masses of our heroic people that it would remain loyal to the promise of the Martyr Dalal and her companions, and to all the Martyrs, until freedom, independence and return." In yet another event lionizing the arch-terrorist, Deputy Governor of the Jenin District Abdallah Barakat "mentioned the Martyr Dalal Mughrabi, who taught the world about dedication and love of the homeland." Social media was not ignored as an outlet of terror celebrations. Last Tuesday, Fatah wrote on its official Facebook page "the waves of the sea raged and disgorged eleven stars. Dalal and her friends had decided to return to their homeland as heroes." The page further romanticized the mass murderer by saying she "planned to make Zionism tremble; she [Dalal] destroyed two large buses and killed more than 100; and the flag of Palestine waved in the skies of the occupied land." The attacks took place between Tel Aviv and Haifa.